What do you get when you combine rich, creamy beef stroganoff with cheesy macaroni? Macaroni and cheese stroganoff — an instant family favorite that’s quick and easy to prepare. 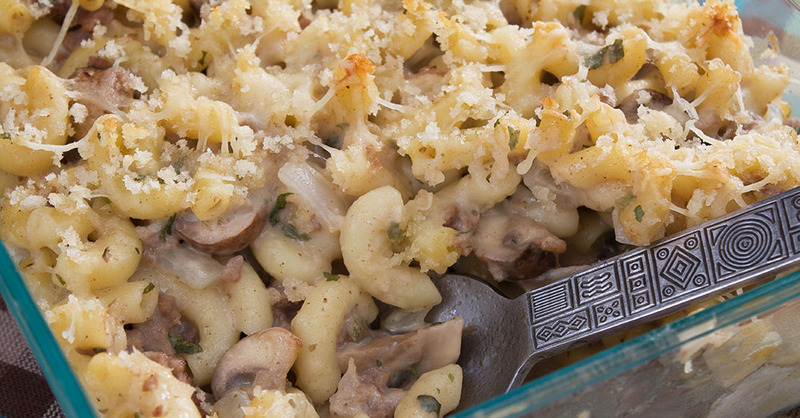 We love the hearty mushroom sauce; kids love the beefy, cheesy macaroni. This is one of our favorite go-to recipes for rushed weeknight dinners. It’s ready for the oven in less than 15 minutes, leaving plenty of time to look over homework as it bakes. Preheat oven to 300º Fahrenheit. Place large skillet over medium heat. Add ground beef, onions, and mushrooms. Season beef with salt, pepper and garlic salt, and continue to cook until meat is brown and vegetables are tender. Drain and return to pan. Stir in soup and sour cream, and combine thoroughly over medium-low heat. Add cheese in small batches, stirring continuously until melted. Add cooked macaroni to meat mixture, and combine well. Pour ingredients into greased 13x9-inch baking dish. Toss panko crumbs in melted butter. Sprinkle buttered crumbs over pasta mixture, and bake for 30 minutes.